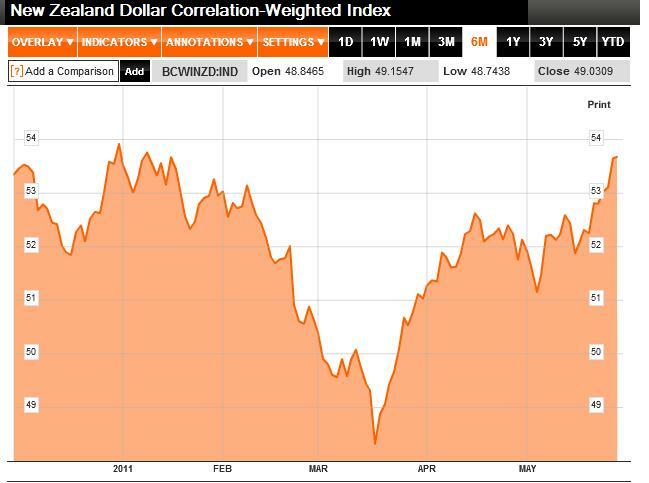 New Zealand Dollar: Come Back to Earth! In March, I wondered aloud about whether the New Zealand Dollar might be the most overvalued currency in the world. Since then, it has continued its unlikely ascent, rising 10% on a correlation-weighted basis and 3% against the US Dollar, hitting a 26-year high in the process. While there are signs that the New Zealand economy might be able to withstand an expensive currency, at some point, the chickens must come back to roost. Surely the expensive kiwi must be wreaking havoc on the New Zealand dollar? “How is New Zealand supposed to rebalance its economy away from consumption, importing, borrowing and asset selling towards investment, production, exporting and asset buying when our currency is headed for record highs?” Wonders one commentator. 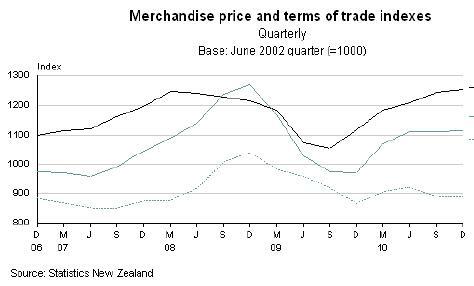 In fact, exporters are coping just fine, and New Zealand just recorded its highest quarterly trade surplus on record. Never mind that this is due almost entirely to soaring prices for commodities and unflagging demand. In spite of two earthquakes and other related downside factors, the New Zealand economy is nonetheless forecast to grow by 2.3% in 2011. On the other hand, New Zealand’s current account deficit continues to rise, as foreign investors pour in to New Zealand to make acquisitions, portfolio investment, and loans to the government. New Zealand’s largest dairy conglomerate could soon be sold to Chinese investors, while China’s sovereign wealth fund (which manages a portion of the country’s sprawling forex reserves) has announced plans to purchase a big chunk of New Zealand government debt. This is just as well, since a record 2011 budget deficit will require a significant issuance of new debt. Let’s review: record low interest rates and record low real interest rates. Record budget deficit. Large current account deficit. Declining expectations for GDP growth. Record high New Zealand Dollar. Does anyone see a contradiction here? It’s no wonder that the IMF recently speculated that the Kiwi might be overvalued by as much as 20%, echoing the sentiments of yours truly. At the same time, commentators concede that “The New Zealand dollar or any currency can deviate for a long period of time from academic measures of valuation.” And that is why making fundamental bets on currencies is so difficult. Even if all signs point to down (as is basically the case here), a currency can continue rising for many more months, before suffering a massive correction. 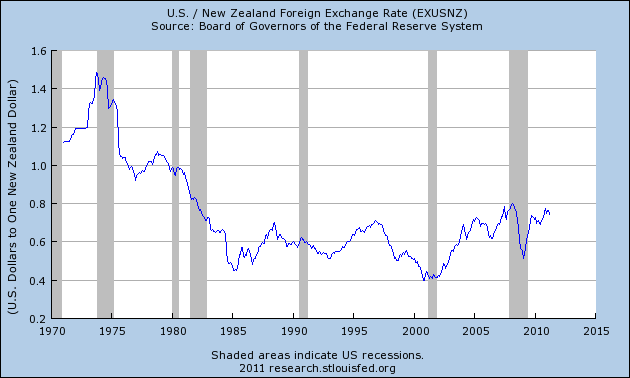 For what it’s worth, this is the fate that the New Zealand Dollar is resigned to. Whether it will happen tomorrow or next year, alas, will depend more on global macroeconomic factors (such as the ebb and flow of risk aversion) than on what happens in New Zealand. Is the Kiwi the Most Overvalued Currency? During recent interviews with the Forex Blog, both Mike Kulej of FX Madness and the team at Action Forex imparted their beliefs that the New Zealand Dollar is currently the world’s most undervalued currency. Since I hadn’t written about the Kiwi in a few months, I decide to some research, ad came to a slightly different conclusion. In keeping with the spirit of debate, I’d like to defend the opposite premise- that the New Zealand Dollar is now one of the world’s most overvalued currencies. There are two principal reasons for the Kiwi’s perennial appeal with forex traders. First, New Zealand frequently boasts some of the highest interest rates in the industrialized world. Before the credit bubble burst, New Zealand’s benchmark interest rate was a whopping 8.25%. Moreover, because of its association with Australia, investors are quick to ascribe to it (dubiously) a greater sense of security than they would to emerging market economies with similarly high interest rates. For example, while Brazilian rates are usually higher, the markets less apt to lump the Real together with the Australian Dollar, even though it’s arguably a closer fit than the Kiwi. While it’s hard to predict New Zealand trade dynamics, we can say with relative certainty real interest rate levels will remain low for the foreseeable future. Two recent earthquakes have threatened an economy that is already in trouble (projected GDP growth in 2011 is only 1.3%). Over the next 12 months, the markets have priced in only 50 basis points in rate hikes. “Nothing here will change the RBNZ’s intentions to keep monetary policy at ’emergency’ levels for the rest of this year,” summarized one analyst. Meanwhile, the CPI rate is currently at 4.5%, and is generally tracking commodities prices higher. The credit crisis should have shattered the myth of the NZD as a stable currency, since the NZD lost 50% of its value in a matter of months. In addition, the benchmark rate has been lowered to 2.5%, a record low. When you take inflation into account, the rate is -2%, which as far as I know, is among the lowest in the world. When you factor in consecutive budget deficits for the first time in two decades and the (unrelated) explosion in public debt, it baffles me that yield seekers would still be interested in holding the Kiwi. The other source of strength is the perception that the Kiwi is a commodity currency. To be fair, the production and export of agricultural products (dairy, meat, wool, etc.) makes a significant contribution to New Zealand’s economy. 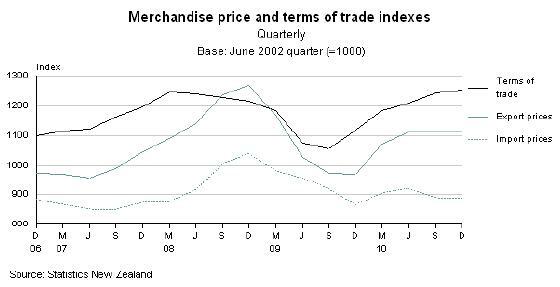 In addition, the prices for such agricultural staples have been rising faster than prices for imported goods, to the extent that the terms of trade have widened further in New Zealand’s favor. Unfortunately, this is ultimately irrelevant, since the aggregate balance of trade is currently in deficit, where it has stood for most of the last decade. If prices for energy and traditional commodities continues to rise, the current account deficit would at risk for eclipsing the record 6% set in 2008.